This one-of-a-kind Easter gift arrangement is absolutely gorgeous! It is a fantastic choice for for the adults on your gift list as well as the children. It offers two large and incredibly sweet, plush bunny rabbits from the world famous Bearington Collection! They are adorable! This gift basket also includes a collection of some of our finest gourmet gifts and sweet treats! This is a wonderful Easter gift for anyone on your gift list! 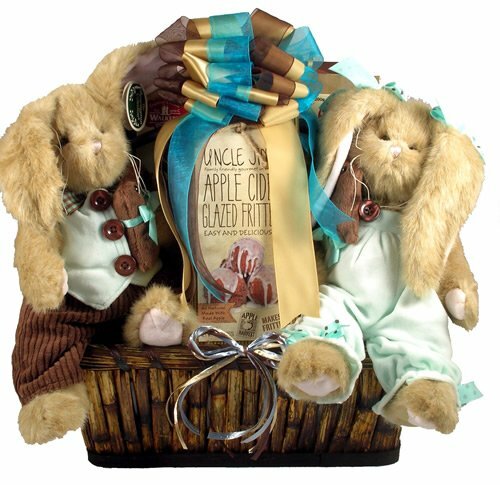 This incredible Easter basket contains: 2 Super-soft plush bunnies from the Bearington Collection, Apple Cider Glazed Fritters, Original Creamy and Nutty Brazil Toffee and Hammer Gift Set, Chocolate Caramel Peanut Clusters, Shortbread Cookies Dipped In Semi-Sweet Dark Chocolate, Chocolate Pillow Cookies, Chocolate Blueberries, Chocolate Strawberries, Cookies and Cream Crunchers, Chocolate Almond Bark, Godiva Dark Chocolate Covered Pretzels, Godiva Milk Chocolate Covered Pretzels, Godiva Dark Chocolate Covered Almonds, Godiva Milk Chocolate Covered Cashews. Let there be no questions here, this is one of the finest Easter baskets available anywhere - with the possible exception of the Easter Bunny himself. Amazing! View More In Assortments & Variety Gifts. If you have any questions about this product by Organic Stores, Inc, contact us by completing and submitting the form below. If you are looking for a specif part number, please include it with your message.